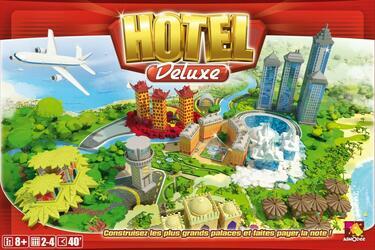 The players play as wealthy tycoons who will become owners of luxury hotel complexes around the world. They will have to travel in their private planes, try to obtain building permits, then invest in the construction of buildings and the placement of entrances. Then, all players who visit their hotels (by the entrance!) will have to pay the night (and it is not cheap!). Unfortunately, our businessmen will gradually ruin themselves, until there are only two left. At that moment, the bank will stop giving them money and the game will quickly end with the victory of the ultimate tycoon! The return of a great classic, in a modern and revamped edition! Contents of the box : 1 board, 1 pack of tickets (tickets of 50, 100, 500, 1,000 and 5,000), 1 normal die + a "building permit" die, 30 hotel entrances (used to pay for overnight stays), 28 buildings + 8 leisure centres + 1 hangar + 1 control tower, 8 property titles, 4 planes, 1 game rule.